Many commercial building owners are under the impression that they are skilled enough to make roof repairs. Patching a small tear of resealing weathered flashing seems simple enough. But at the end of the day, there’s an entire construction sector dedicated to roof repair and installation for good reason. 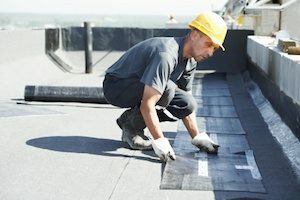 Should you hire flat roof specialists to make your repair? The answer is yes! Here are four reasons to hire flat roof specialists. People who are new to flat roof repairs will inevitably go through a trial and error learning curve. It may seem like you’re saving money by doing it yourself, but the potential damage to business operations and electrical fixtures can definitely outweigh any savings. You may also allow potentially harmful mold growths to develop as moisture penetrates into ceilings and walls. The cost of mold remediation is quite high. Experienced flat roof specialists do this work every day and get it right the first time. Perhaps the most common accident that occurs during roofing repairs is a fall. Whether its slipping from a ladder while hauling up tools or falling through a hidden soft spot under the tar and gravel. Long-term water seepage can rot timbers and beams. Professional are well aware of the various hazards and are far less likely to be injured than a novice. The tendency to patch leaking roofs can be very enticing. Many property owners feel they’ll save money by putting a few Band-Aids on damaged or decaying areas. People that work in the flat roof industry have a keener sense about the appropriate time to make a repair or full replacement. Roofs that have outlasted their life expectancy tend to spring chronic leaks. Flat roof specialists can conduct a full inspection and determine which path may be the most cost effective. Carpenters, general contractors and other building professionals either handle the broad strokes of construction and repair or they have their own area of expertise. Flat roof specialists work on exactly the type of roof that you have every day. That basically makes them the most knowledgeable skilled labor for these particular jobs. If you think about it, you wouldn’t hire a plumber to do brain surgery. So, why would you hire a general contractor to work on a very specific type of roof? Expertise matters. If you are experiencing leaks or want to be proactive about maintenance and replacement, contact the flat roof specialists at Montgomery Contractors for a free estimate.